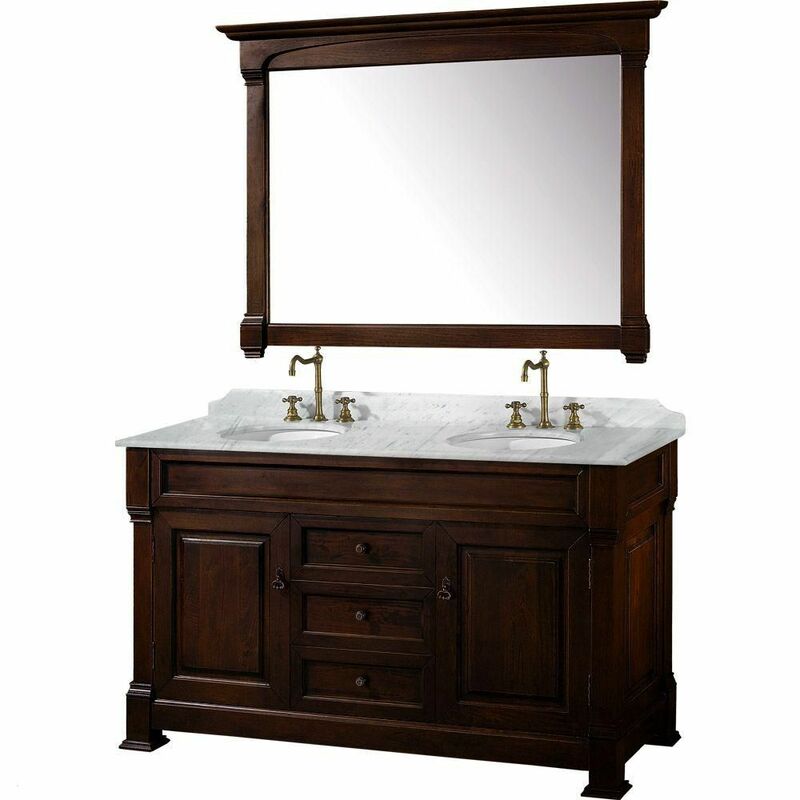 Andover 60-inch W 3-Drawer 2-Door Vanity in Brown With Marble Top in White, 2 Basins With Mirror Enjoy the popular classic look in your bathroom with this beautiful vanity. Its beautiful white marble counter and brown solid wood base bring a great new look into your bathroom. The double-door cabinet and drawers are great for putting away bathroom items. This simple vanity set from Wyndham Collection will fit right into any bathroom decor. Andover 60-inch W 3-Drawer 2-Door Vanity in Brown With Marble Top in White, 2 Basins With Mirror is rated 4.6 out of 5 by 16. Rated 4 out of 5 by Donald from Good product,however,I was disappointed that it didn't have recessed hinges.... Good product,however,I was disappointed that it didn't have recessed hinges. Rated 5 out of 5 by Olena from Though the mirror arrived broken (we're waiting for the replacement),... Though the mirror arrived broken (we're waiting for the replacement), the vanity is excellent in every way. Beautiful, functional and stout. The marble counter (with already mounted sinks) was crated properly and is gorgeous. Only questionable thing is the unit came with a couple chromed drain-pipe plumbing pieces with no explanation - couldn't use any of it with the faucets we purchased. Overall this is an exceptional vanity. Rated 4 out of 5 by Anne from The cabinet arrived in good time! The packaging... The cabinet arrived in good time! The packaging and delivery were excellent. The cabinet and mirror were in very fine condition, no flaws. I was so pleased to discover this vanity at such a reasonable price. It exceeded my expectations in every way. Rated 5 out of 5 by Margo from I loved it. Was really easy to install. Looks beautiful.... I loved it. Was really easy to install. Looks beautiful. Rated 5 out of 5 by Caitlin from I was extremely impressed with the way this vanity came... I was extremely impressed with the way this vanity came in packaged. I was so worried that it was going to be damaged, but there were no scuffs or cracks. Thank you for taking the time to package it well.